Before you get started, it’s important to make sure you have everything you will need. Aside from your frame and hanging hardware all you really need is a screwdriver, hammer, pencil and for perfection a spirit level, for heavy frames you will also need a power drill. Using your trusty pencil, mark the exact central position on the wall where you wish to hang your frame, remember to take onto account the slack in the cord! for the demonstration we have used a single hanging hook and nail. If you do have a heavy frame, we do suggest a rawl plug and screw to guarentee a safe and sturdy fixing. Start by drilling a suitably sized hole with a power drill. WARNING: Check for wires and pipes in the wall before drilling! 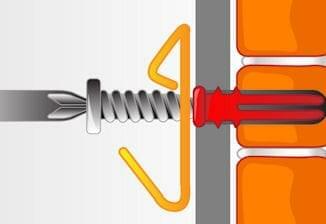 Insert the appropriate size screw through the hook if you are using one and tighten to the wall, if you are not using a hook, screw in the screw and leave 10mm-15mm proud from the wall. Hang your picture frame from the hook or screw by gently lowering the cord onto it. to make sure it’s Just right! And thats it, all done ! All that’s left to do now is to stand back and admire your good work.